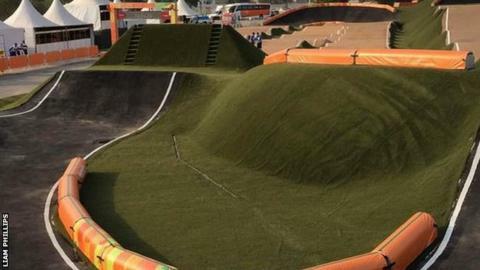 A BMX test event for next year's Rio Olympics has been put back a day after riders refused to race on what they claimed was an unsafe course. Riders, including Britain's BMX Supercross double World Cup winner Liam Phillips, said some big jumps were too dangerous. Phillips wrote on instagram: "We shouldn't have to 'race' on such sub-standard tracks." The test event will now take place on a modified course on Sunday. Philips, 2013 BMX world champion, added: "Although I feel the sport took a step backwards today with the riders refusing to ride, it was extremely necessary for the riders' safety. "We, more than anyone else, want a platform to showcase the sport of BMX." The course is designed by Tom Ritzenthaler, who designed the last two Olympic courses in Beijing and London. The BMX event is not the first to run into problems during preparation for next summer's Olympics. Sailing's governing body has warned that events could be moved out of Rio's polluted Guanabara Bay.